MEMBERS OF the Maynooth Students’ Union who are occupying the Naas constituency office of Fine Gael TD Anthony Lawlor in the latest escalation of the wider student movement against fee increases and cuts to third-level grants are refusing garda requests to leave the building. Speaking to TheJournal.ie from inside Lawlor’s office, the Maynooth SU’s president Rob Munnelly said the students had come equipped with a chemical toilet and enough food for a week. Munnelly said they want Lawlor – and all government TDs – to commit to protecting student grants from cuts and to not raise fees. He said that he and his eight SU colleagues have also brought sleeping bags and are prepared to stay until they succeed in their campaign – or are forcibly removed by the gardaí. Munnelly added that student unions across the country have been making thousands of phone calls and sending emails and Twitter messages as part of their campaign, but that the campaign is escalating: “We’re left with absolutely no choices – it’s come to this, which is occupying a TD’s office”. He also said that the group has been receiving strong support from other students by email as well as from people on Twitter and Facebook. Lawlor’s staff told TheJournal.ie this afternoon that they did not feel threatened by the students but were reluctant to leave the office as the students warned them that they would not be allowed back in again. Lawlor could not be reached this evening for comment. A number of gardaí are at the scene. Nine Galway students were arrested earlier this week after occupying the constituency office of Brian Walsh TD. 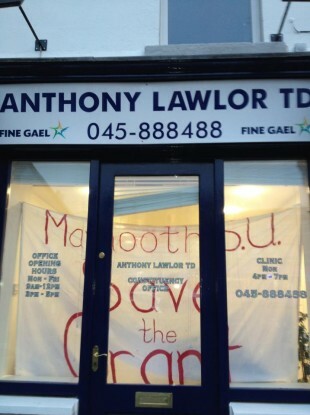 Email “Maynooth students continue occupation of Fine Gael TD’s office”. Feedback on “Maynooth students continue occupation of Fine Gael TD’s office”.